As Dan Rhodes’ star grows ever ascendant, he is certain to attract more and more stalkers. However, before you start rummaging through his bins, hacking into his medical records, having a picture of his face tattooed across your own face, or sending him your novel-in-progress for appraisal, you really should make sure you’ve read all his stuff. This page collects his various micro-appearances, and below them are some book jackets festooned with his ringing endorsements. 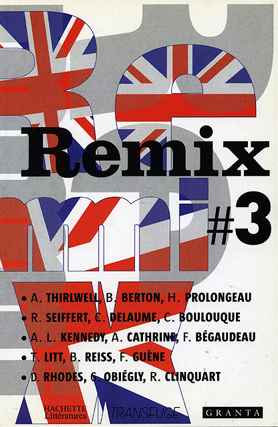 This Tibor Fischer and Lawrence Norfolk-edited anthology, with its Peter Blake jacket, marked Rhodes’ first appearance in print. This book contains the stories Blind (in a microscopically different form) and Milestones from Anthropology. This anthology contains the work of various students and graduates of the University of Glamorgan’s creative writing department. 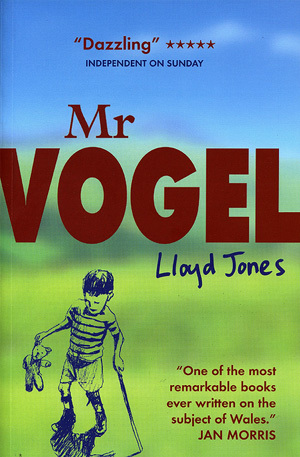 It contains three very short Rhodes stories that aren’t found anywhere else – Russians, Surprise and Funny. This seems to be a literary remix of a passage from The Little White Car. Although our Breton is faultless, our French is a litle rusty, so we’re not sure what’s going on. This has something to do with Transfuges magazine, who we think once interviewed Rhodes at Gordon’s Wine Bar on Villiers Street in London, and then took a load of photos of him in The Harp in Chandos Place. We never saw the magazine, so we might just have dreamt this. Rhodes’ author photo in this edition pretty much sums up his feelings towards the circus surrounding this edition. 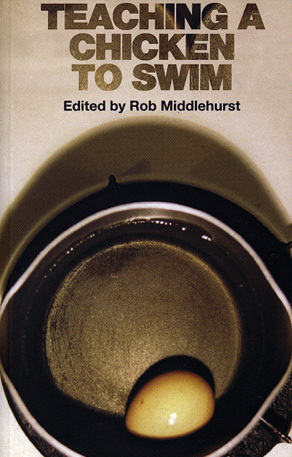 An edited extract from Timoleon Vieta Come Home was included in this anthology, which is worth having a look at if only because it contains that rarest of things – new writing from the great Ben Rice. Rhodes only found out about the existence of this when he chanced upon it at Barcelona airport. We can’t help wondering if there are other editions of it floating around that we don’t know about. 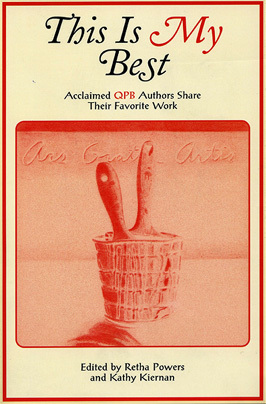 After winning the QPB New Voices Award in 2004, Rhodes was asked to contribute to this anthology. 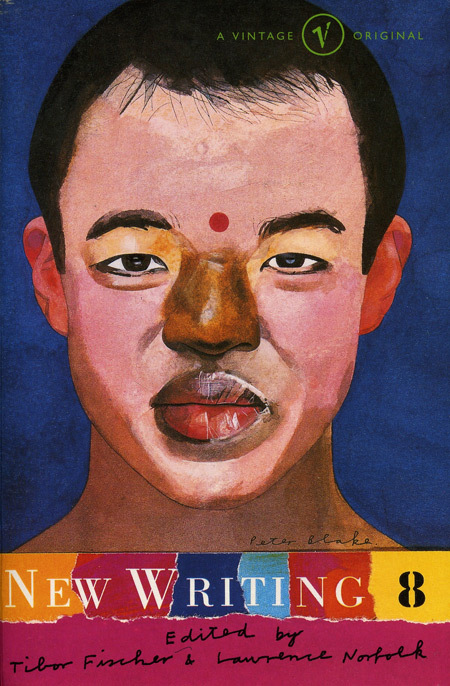 It contains a few stories from Anthropology, all of them written in March 1998, and an introduction about how he came to write them. A thick book, full of interesting bits and pieces, it’s well worth a look. Rhodes has a very strict no-blurbing rule. However, in fits of passion he will sometimes break this rule. Below are some books where his endorsements festoon the cover. 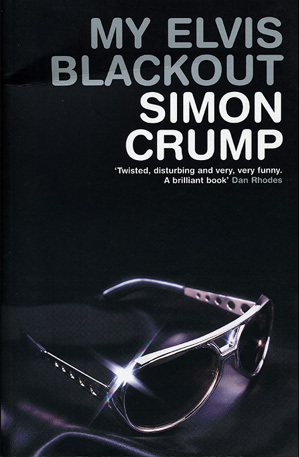 It’s baffling to think that there are still people in the world who don’t own a copy of My Elvis Blackout. 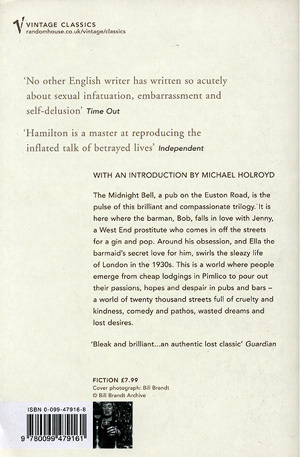 This is the back cover of the current edition of Twenty Thousand Streets Under The Sky by Patrick Hamilton – one of the best books ever written. Rhodes’ quote can be seen right at the bottom. It wasn’t attributed to him, possibly because he had recently told a prominent mem-sahib at the book’s publisher (Random House) that she could chew his sock. The quote is plucked from a Guardian article Rhodes wrote to mark what would have been Patrick Hamilton’s 100th birthday, had he not drunk himself to death in 1962 (or died in some other way between then and March 2004). You can read the article here, but it’s best not to until you’ve read Twenty Thousand Streets Under The Sky because it might spoil the ending. 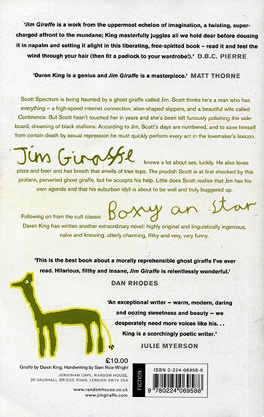 This short, come-buy-me quote ended up on the back cover of Daren King’s Jim Giraffe. The word is that it made the front of the Canadian edition, which makes little sense as Rhodes is in no way beloved by the Canadian reading public. Sylvia Smith was one of the best writers around, and we miss her. Were he alive today, Cyril Connolly would almost certainly add ‘a blurb from Dan Rhodes’ to his list of Enemies of Promise. There is no evidence to indicate that endorsements have any kind of positive effect on the sales of these books. If anything, quite the opposite appears to be the case. There will be a few more of these to come, just as soon as we can get around to scanning them.